Even if you are using the right security settings on your Wi-Fi, a bad password makes it too easy for attackers to break in. Make your Wi-Fi password as long as possible, ideally more than 14 characters. Don’t use words from the dictionary or easy-to-guess information about you like your name or birth date. We have more password tips here. Leaving your wireless network name set to a default like “default” or “linksys” makes cracking the password much faster and easier for a criminal. Change your network name to something unique to improve your security. However, don’t reveal too much personal information, like your name and address. Learn more about wireless networks here. When we set up an insecure Wi-Fi network on our warbiking tour, a shocking number of users happily connected to our open wireless network without any idea whether we were honest people, or out to do harm. If you connect to a network, the owner of that network could insert code on your computer or redirect you to a malicious website. 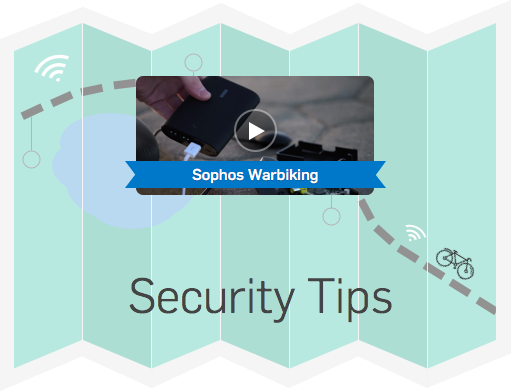 Get 10 security tips for mobile devices here. Attackers can take control of your computer and steal your sensitive information by exploiting security vulnerabilities in software. Keep your operating system, software and web browser patched with the latest security updates at all times. Learn more about securing your web browsers here. A VPN or Virtual Private Network is a very simple tool for securing your information with encryption—and then forwarding it to a secure host before it goes out to the Internet. Encryption with a VPN means that even if you join a suspicious wireless network, the attackers can’t see or modify your private information. Learn more about personal data security here. HTTPS means the information is encrypted between you and the website you are visiting, providing extra security against cyber attacks. Not all websites support it, but major websites, such as Facebook and Twitter, do have it—you can tell because the web address starts with https://. You should also check that you enable the SSL option if you have an email client. WPS is a feature that is designed to make connecting to your wireless network really easy with a short PIN, or a click of a button. You may spot it on your wireless networking equipment or in the Wi-Fi settings on your router. Attackers can gain access to your network within hours if you use WPS. Instead, use a good secure password and have your devices remember it. Perhaps you carry around a mobile hotspot, or a smartphone or smart navigation system? Many of these devices allow connections via other wireless technologies, such as Bluetooth. Often these devices have a default security PIN such as 0000, 1234 or 9876. None of these are particularly difficult for an attacker to guess! Make sure you change these PINs to something secure. Where possible, limit use of "discoverable" mode so your devices aren’t as easily found by attackers. Finally, disable wireless when you don’t need it. It's not all about PCs! You might have a wide variety of “smart” devices using wireless in your home and all around you at every moment. Your smartphone could be vulnerable to attack, so use SSL to access your email and your social media accounts. Check each of the devices you have connected, whether it is a mobile phone, laptop, or something else like a Wi-Fi connected fridge. Android users, you can download some free security software here. Our free Virus Removal Tool is a quick and easy way to find and get rid of any threats lurking on your computer. Keep your Mac safe from threats with this free antivirus tool designed specifically for Apple desktops and laptops. Protect your Android phone from the latest threats with our free antivirus for Android.